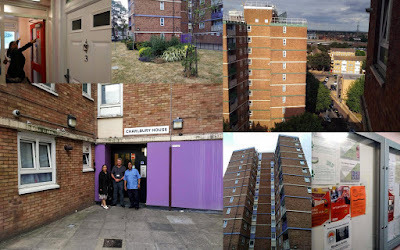 Picture collage from this evening when I did a home visit to Charlbury House with local Little Ilford Councillors, Councillor Riaz Ahmed Mirza and Councillor Pushpa Dipaklal Makwana about an ongoing leak in the block affecting a number of flats that needs sorting. We did a "walkabout" from top to bottom afterwards and around the outside. The block was generally clean and in good repair but I will be making a number of on-line communal repair & cleaning reports via #LoveNewham app and also assist Cllr Mirza in the chase up of the leak. I forgot to discuss with the ward Cllrs about "Art in Blocks" but it would appear that there is already a secure notice board (bottom right) that perhaps we can use?